Nothing beats a relaxing spa after a long day of beach activities. Check out the pampering treatments at Terra Wellness Spa, located at Discovery Shores Boracay. Boracay Island is still a favorite destination in the Philippines among tourists, whether foreign or local. Proof of this is the recent recognition from the 2016 list of Best Islands in the World by Travel + Leisure Magazine. Aside from the crystalline waters and the powdery white sand of Boracay, there’s definitely a great number of activities and experiences to discover on the island. A number of these exciting activities to enjoy are helmet diving, flyfishing, island hopping, snorkeling, stand up paddling, parasailing, sunset sailing and banana boating. With these all-day beach activities, the next best thing to do is to have a pampering spa treatment. 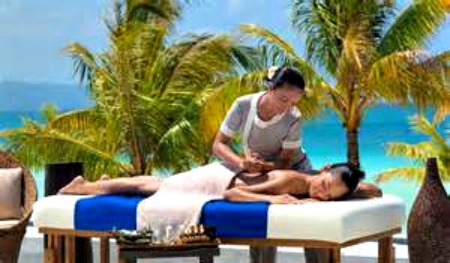 There are a good number of spas in the island but the excellent choice is to go for the best spa resort in Boracay. At Discovery Shores Boracay, you can indulge in a blissful spa experience at Terra Wellness Spa. Choose from exclusive spa offerings that are perfect for that much needed R&R. Enjoy Terra’s Touch with an additional time for relaxation at only PHP 1,700 nett per person. Instead of the usual 60-minute massage, guest can indulge in an additional of 15 minutes. This offer is available all day. Another exclusive offer is the “Hilot Haplos” which is good for 90 minutes for a special rate of PHP 3,000 nett per person. This offer is available from 10am to 6pm daily. Both exclusive offers are only available until 15 October 2016. To view more information or to book a treatment, please go to www.discoveryshoresboracay.com/terras-blissful-spa-escapes. Discovery Shores Boracay is an award-winning 87-suite luxury resort at Station 1 of White Beach.